I got my German Shepherd baby when he was 8 weeks old and instantly fell in love with my puppy. He's 1 1/2 years old now, weighs 92 lbs and is one of those 'very tall shepherds. I worry why he grew so tall? He was neutered at 6 months of age...does that have something to do with him getting tall? I just hope he stays healthy. Loves to play in the water, is addicted to bacon strip treats and whines and moans when you don't listen to him. So very intelligent and understands so many words in two languages. Mostly Obedient but sometimes ignores you totally and I have to raise my voice a bit. Has brought so much joy in our house and has such positive energy that the happiness wears off on everyone in the house!! My best advice to you about the hip issues is to keep him lean. If he gets too heavy that will be a bad thing for his joints - especially the hips - so keep him lean and he'll have a much easier time of it. Also, Glucosamine Powder, liquid or pills is a lifesaver for joint problems. I put all my adult GSDs on it - especially once they get past about 4-6 years old. Just keep an eye on him for signs of pain - GSDs are very stoic and it takes a trained eye to know when they're in pain sometimes. Good luck with your teenager! He manages to pull his hind legs and I'm not sure if it's from all the galloping he does in the yard, chasing cats and birds, or if trouble is brewing. He's 5 1/2 yrs old now.I should take him to the vet soon and see what's happening. My vet suggested Phycox, and I give him that in the winter months usually when he strains his legs walking on the snow and ice.worried though...can't tolerate the thought of him suffering or being unwell. Have cut down his food too to get him leaner, although he's not fat but has gotten a bit chunkier. We learn for one another, thanks for everyones support. I also add turmeric in his chicken/rice/veggie/lentil gruel I make for him, which I add to his dry food everyday about half cup at a time. Well, he's 3+ now. So far so good with his hips. I try to exercise him fairly regularly, add some home boiled chicken and veggies to his kibble, feed him kibble that has glucosamine added to it already, give him fish oil few times a week based on suggestions from so many friends. He's 3 now and Hips still doing OK so far even though at 6mth old doc said he has propensity for developing it later. So for so good. Love him, love him, love him so much. I try to supplement his kibble with fish oil, fresh boiled chicken, greens and other vegetables. But now he's so spoilt, won't eat his food without the chicken. I say the word chicken and his ears perk up and eyes shine! Has a good vocabulary and understands so much language, just can't talk back. First of all, your boy such a delight to look at! He's beautiful! Second of all, you're absolutely right about their intelligence & whining at being ignored! My three month old GSD Boy Rusty does that too! 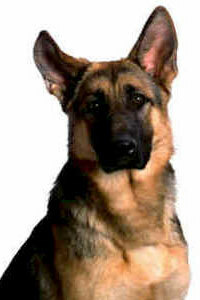 GSDs are a great species to have around, aren't they? I've experienced hip problems with several of my GSDs, also. As said in the previous comments, they hide their pain well. Swimming is great and very gentle on the joints. It added an additional two or three years on my last girl's life beyond what was expected by having a pond for her to swim in at her leisure (which was several times a day!). The wet coat drove us crazy but we put up with it for her well being. Her bad hips and knees showed up before she was 1 year old. She made it to 11 years old! Walk your boy regularly, keep him exercised, let him run so he can keep those muscles stretched out (not tight and stiff) around the hips for as long as he can tolerate it through his life. Try to avoid having him jump up for things, like catching a frisby in the air; this put too much impact on the hips. Feed him as good a quality food that your budget can afford to buy. We waited to give prescribed medication for pain management until the last few years when she really needed it (but, that must be a personal decision made by each owner). Have fun with your boy! He will be the most loyal friend you ever had! I have a 21 months old GSD. He has had elbow hygroma several times when he was a young pup. My vet took good care of that. Also, my dog slipped on the tiles and took a bad fall a few months ago. The X-rays showed a beginning of hip dysplasia, nothing too serious though. My vet recommended Cosequin DS, chewable tablets for him, just preventively, to avoid later hip dysplesia problems. I've been giving my dog two tablets a day every day and I intend to have him on it for the rest of his life. They are not cheap, but if they will keep my dog healthy, they are worth it. Join in and write your own page! It's easy to do. How? Simply click here to return to GSD Growth Form.